Prov: From the artists studio, Suffolk. Patrick George is a painter of rare and original talent, forty years at Slade School as professor and later as director he has only shown his work infrequently. Commentators have labelled him a ‘school of London painter’ to be viewed in the same context as Lucien Freud – a friend from his schooldays, Frank Auerbach – a strong supporter of George’s work and Euan Uglow, a close friend and colleague. Born in Manchester in 1923. 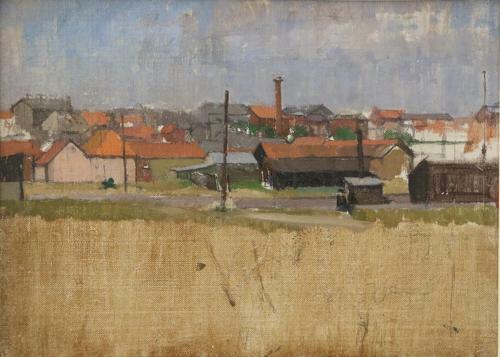 He began his art training with a scholarship to Edinburgh School of Art, before serving with distinction in the Royal Navy in the Second World War. He continued his art school training at Camberwell School of Art. In 1949, at the invitation of William Coldstream, he joined the Slade School of Fine Art where he taught for many years, becoming Slade Professor-Director from 1985-1988. Patrick George featured in the seminal exhibition ‘Eight Figurative Painters’ at Yale Centre for British Art, curated by Andrew Forge in 1982, it was his only major appearance in the United States. His co exhibitors were Francis Bacon, Euan Uglow, William Coldstream, Frank Auerbach, Lucien Freud and Michael Andrews. That George is not as famous as any of his contemporaries is in large measure due to his modesty and lack of worldly ambition, as a consequence he is not as well known as he should be. In 1961 he moved to Hickbush, Sudbury, Suffolk where for 25 years he painted his finest landscapes, the Tate owns two of them. He said that he painted landscapes in Suffolk and portraits and still life in London. In 1980 there was a retrospective of his work at the Serpentine Gallery, London. Works are in the collection of The Arts Council, National Portrait Gallery, Imperial War Museum and Tate Gallery.